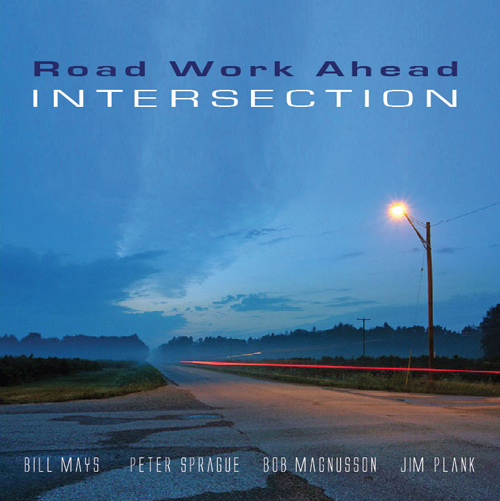 The Road Work Ahead band intersects on a California tour in 2012. We got our band name as both a reminder of where we want to be (playing jazz on the road), and also with the hope of lassoing an endorsement deal with the California Department of Transportation. We’d like to be their poster people of what jazz and freeway repairs sound like. We’d like to see bebop and jackhammers coexist peacefully on the 805 / 5 merge. Someday it’ll happen! We rent a van and share new music and stories, concertizing from San Diego to Sebastopol. All sharpened up from the tour we head to the recording studio and document the sounds. Now we can share it with you. Enjoy the ride! Here are some insights into the tunes written or arranged by each of us. “Inchworm” — composed by Frank Loesser, arranged by Bob Magnusson. “Inchworm” was first sung by Danny Kaye in the 1952 Samuel Goldwyn film Hans Christian Andersen. The original version had two counterpoint melodies. This arrangement opens with the piano playing the first melody that the children sing; then the guitar states the well-known Danny Kaye theme. This simple melody has always had special meaning for my family. My wife Janet and I sang it to our children when they were little, and now we enjoy singing it to our grandchildren. “The Very Thought of You” — composed by Ray Noble, arranged by Bill Mays. “You Go To My Head” — composed by J. Fred Coots, arranged by Bill Mays. “You Go to My Head” is most often heard as a ballad but I enjoy playing it up tempo. We engage in some simultaneous improvisations and phrase-trading before finally stating, in the last chorus, the written melody. “And I Love Her” — composed by Lennon and McCartney, arranged by Peter Sprague. This is one of my favorite Beatles tunes ever. I love the bass line figure that is so iconic to this gem. The band treats the song perfectly— the original vibe of the song is still there even though the harmony and feel has been changed. Bob takes a great solo on the ending vamp. “Wall Street” — composed and arranged by Peter Sprague. I wrote this tune for the group and as I was in the process of composing it became clear to me that I ought to call the song “Wall Street.” It starts with some high-tension educated notes leading to a riff that embodies the smirky swagger of someone who just got away with something. “Saudade de Voce” — composed and arranged by Peter Sprague. The inspirations for this song are the gentle sounds of Brasil’s Antonio Carlos Jobim mixed in with the stark lonely beauty of Chopin. Two different worlds sharing the similar story of longing. “There’s a Small Hotel” — composed by Rogers and Hart, arranged by Bill Mays. “There’s a small hotel, with a wishing well, I wish that we were there together” — so the happy lyric goes. I wanted this 1936 pop song to have an off-kilter “edge” to it. I once stayed at this very hotel; I was uneasy–there was a bit of a strange undercurrent to it and I tried to capture it in this chart. I thought it’d make a great vehicle for Jim Plank’s inventiveness, and an oblique statement of the theme with only the drums soloing. I only suggested this title, Peter and Bill made it what you hear. Because of the many years RWA has been together, developing ideas for new music is always influenced by the knowledge of each person’s playing. I think this recording reflects that element. “Wynton’s Motif” — composed and arranged by Bob Magnusson. This is a dedication to the late, great pianist Wynton Kelly. Years ago I transcribed his piano solo from a blues entitled “Pot Luck” from the 1960 Vee Jay recording, Kelly at Midnight. In this arrangement I included excerpts from his solo over a new harmonic progression and recurring rhythmic pattern. When we arrive at the faster tempo, in unison Bill and Peter quote the first four choruses of Wynton’s blues solo. “Our Waltz” — composed by David Rose, arranged by Jim Plank. As a young person in the 1950’s, I heard David Rose’s music on radio and television. “0ur Waltz” is the definitive David Rose composition in my mind. I wanted to give the outer sections a different character, while at some point pay tribute to the original composition. Rehearsing at SpragueLand with Road Work Ahead. 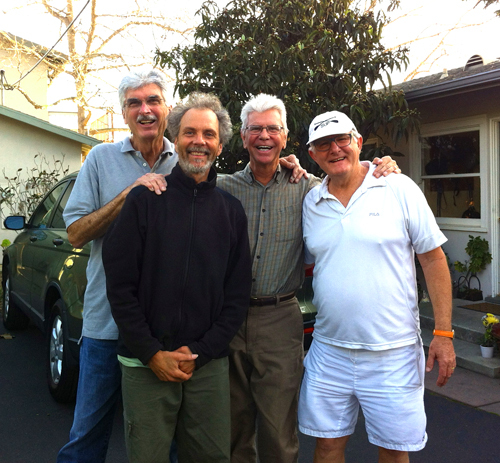 Left to right, Jim Plank, Peter, Bob, and Bill Mays.